It's the difference between night and day! 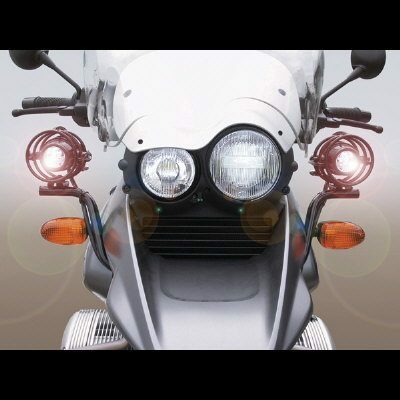 These accessory lights for the R1150GS feature diecast magnesium housings protected by a steel cage. Operational voltage is 25,000 volts, but at only 1/5000 of an amp for a low 35-watt power usage! Hookup is easy and uses the existing wiring and the turn signal cancellation switch for activating the lights. An accessory handlebar switch (Z5190) is also available.